How about sharing your themes? I would like to use your theme if you feel it is complete enough to release. I haven’t been able to find one that is as minimal as I would like and still prepends the sender’s name on every line. I also haven’t had the time to write a theme myself. Yours looks just about like what I would write (minus the lighter text). Also, they have a nice ticket system for bug reports and feature requests. You might want to create a ticket for the logs. I thought I’d let you know that Adium will be switching to a XML based log format with it’s upcoming 1.0 release. The theme isn’t quite ready for release, but when it is, I’ll certainly be happy to make it available. rollercoaster375: that’s interesting—probably overkill, in my opinion, but if it has all the needed information it would at least be easy to transform. Do you have a pointer to information about the structure of the log format? I personally use Proteus. 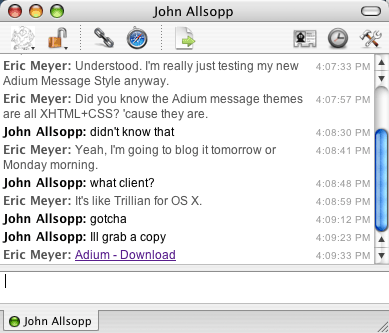 It, like Adium, is based on libgaim, and also uses WebKit for message themes (the first beta of Proteus 4 came out before Adium had message themes). This is cool. Does anyone know of a chat client for Windows that does XHTML+CSS skinning? I’ve been loving Adium for a while. I had a suspicion they formatted the chats via CSS, but I’d never looked into it. What fun! One day, via hChat, biography writers will give the world remarkable insight into the character of one E. Meyer. I like adium a lot (I was a GAIM user on Linux and Windows before switching to Mac at home), but I wish file transfers actually worked. Everytime I want to get or send a file I have to switch to iChat. Ahh I love Adium. It makes IM on Windows feel so poor (although beta 1 of Gaim 2.0 isn’t bad at all). Mike Pond: You can do HTML+CSS theming on Windows using Miranda when combined with a plugin called IEView. Unfortunately this is using the IE6 engine so there’s limits on what you can achieve. Furthermore, everything else about Miranda is, well it’s not in good shape (takes ages to get a nice environment set up, the plugin based functionality results in a terrifying number of preferences and zero UI consistancy). What does your conversation markup look like? I use an orderered list with <cite> and <q> tags in mine, but I”m about timestamps and how to handle some presentational bits like the double colon that follows names (which I put in the markup itself because I want the unstyled thing to look natural, if not pretty). I guess this would be an opportunity to wet my toes with the microformat process, which I”ve always watched from afar because I had no immediate interest in the formats discussed so far. In which I meant to say, of course, that I”m unsure about timestamps and how to handle some presentational bits. That’s a very interesting find. Adium is fantastic. The only thing I miss in it is support for Skype IM. Add that and I would only need a single IM application. Mike: Although meant as IRC only, Chatzilla (the IRC-client bundled with SeaMonkey and available for Firefox) does all its theming with HTML and CSS as well. And can be made into a a general IM-client through a service like Bitlbee. About the message logs: we’re in the middle of redesigning our logging format for 1.0, and the current design is based on XML. If you’d like to get involved, *please* do, we’re lacking in DOM/CSS/XML experts, and input is always welcome. Most of the talking goes on in our irc channel (#adium on chat.freenode.net), but we also have a development mailing list and a forum. Aristotle: I’m using an ordered list myself. The timestamps I’m handling with abbr elements, as in hCalendar, and filling the ISO timestamp into the title attribute. Here’s the markup fragment for an incoming message. I’m not sure there’s any real benefit to using blockquote instead of q— it’s something I’ll have to ponder a bit. Also, the vcard class is kind of a placeholder for the eventual addition of hCard information. For a “next” message, the class is modified to incoming next. For outgoing messages, of course, changing incoming to outgoing. For contextual messages, I just tack on a context class name. And lo, a presentational table was born of non-table markup. The only problem in my quick test was with status messages, which in my theme don’t have a cite element and so threw off the table’s balance (by having two cells in the row instead of the usual three). I could fix that by adding <cite>system</cite>, or something along those lines, if I were going to entable the chat theme, and that would fix the presentational problem. Ah, <abbr>, of course. I”d even read about its use for timestamps, in Tantek”s log. The question of <q> vs <blockquote> depends on the content and default presentation. <blockquote> requires block-level elements – you can”t put text or inline elements directly into it –, and without styling, it renders on a new line. That”s why I picked <q> (which of course conversely means all linebreaks must be <br/>s and there must not be <p> or other block-level elements). Aristotle: You make a good case for q, given the inherent constraints of the medium. I worry a bit about more capable future clients, ones that might allow whole paragraphs and lists and such to be exchanged. In such a case, the use of blockquote would become more compelling. For the moment, though, q serves the purpose admirably. Yes, but it’s necessary for Adium to have it, or else there’s no place for the next message to be inserted, which kind of breaks the whole idea of a chat. I didn’t get too upset about it because we’re talking about a dynamically constructed document whose source will never actually see the light of day—it isn’t logged with that markup and once the chat window is closed, the document is destroyed. I’m not clear on whether Adium requires an actual span or not, or if only the ID is needed. In any case, there certainly wouldn’t be such a thing in hChat/hConversation. I wanted each citation to be just as wide as it needs to be to contain the name, and to make extra lines in multiline chatter line up with the end of the citation. Ah. In that case, given your markup, I think you’re out of luck. With an extra div wrapped around the contents of the list item, you could do what you’re after using the table-related display values (effectively making every list item its own table). Colloquy is another styling-aware IRC-Client. Output is in XML, rendering ist done with CSS on xslt-generated HTML. I worry a bit about more capable future clients, ones that might allow whole paragraphs and lists and such to be exchanged. Good point; having such stuff would be very cool, in fact. I suppose it only requires that clients drop in a <p> for now in order to use <blockquote> across the board. Handling unstyled presentation gracefully is difficult though… hrm. I guess the hypothetical hConversation should just allow both elements? Smarter software could then pick one depending on circumstances. In any case, there certainly wouldn”t be such a thing in hChat/hConversation. Actually, just setting display:table-cell on the <span> and <q> and white-space:nowrap on the <span> is enough. Per CSS, the browser will create an anonymous table within the <li> to hold the items, which gets me the desired effect. I”m coming at this from a “publishable markup” angle though, so I was trying to think of a way to avoid display:table-cell, since support for it is still spotty. I guess there isn”t. Oh well; I”ll live. It took a bit to find the files to edit, so I thought it might be helpful for other less savvy users to post the method for getting to the files. Now you are in the directory with the files to edit. Hope this speeds you on your way to perfectly styled chatting. I’m finding XHTML, CSS and JS are everywhere these days. From XULRunner (Mozilla/XUL for your desktop app) to Adium’s CSS formatting, which I stumbled on a month or two ago myself, while looking at different ways to present logs. And imagine using RubyOnRails locally for your HTML/CSS/JS output? Now that’s powerful. Anyway, I’m so excited about the micro-format idea for logs. And while chats and conversations could be used for it, I think making it more generic for “logging” is even more useful. Especially for gaming logs, which I’ve been puzzling over to display semantically, but haven’t yet found that “perfect” solution. The problem is displaying so much information about what’s going on in-game, along with highlighting what people say. Either way, hChat would fit in here nicely, but expanding it a bit to handle more generic “actions”, like /me in IRC or killing someone in a game is important too. Or what were you thinking of doing for status changes? Now I’m imagining an application that parses hLogs and compares what people are doing at the same time … using CSS vertical bar charts for a calendar-style display? Here is the obligatory reference guide for those having difficulty finding it: http://trac.adiumx.com/wiki/CreatingMessageStyles. Eric, you’re a true master of CSS! I’d love to say a ‘well done’ to you. Adium is nowadays excellent, why don’t you help the devs? I am having difficulty understanding the predeliction towards Adium. 1] you still cannot do voice chat. So although i have added my Google talk account, I am just able to use it as a regular IM. no voice chat at all. 2] ability to go stealth mode (like in yahoo) for particular contacts. Barring these two, what can i say. I would really really love to hear comments. Eric..please. > The theme isn”t quite ready for release, but when it is, I”ll certainly be happy to make it available.